Have you ever heard of the saying, “the right shoes can make or break an outfit?” Similar to this sentiment, the right basketball shoes can make or break your game performance. Choosing the perfect form-fitting and performance-durable basketball shoes can alter the way you train and perform on the court. Take a look at our guide for finding the right footwear below. In finding the perfect basketball shoes, there are a variety of factors to take into consideration. Your shoes have to withstand running, quick directional changes, side-to-side movements, high jumps, defensive maneuvers, and abrupt stops. The position you play can also have an effect on your choice in footwear. As an example, centers tend to jump more and make more plays in the post. This means that they will need a shoe that provides more shock absorption than another position would need. Whether your court is indoors or outdoors will also make a difference in footwear choice. In order to handle these skills on the court, pick a shoe that provides durability, stability, flexibility, support, and shock absorption. To get started, have your feet measured by a footwear professional to determine size along with any additional factors you may need to be on the lookout for. Next, determine what type of basketball player you are. Power players will need a shoe that offers maximum cushioning and stability. A heavier shoe will offer the most support. A fast, all-around player will need ankle support and will benefit from a lighter-weight shoe. Next, determine what kind of shoe-cut you need. High-top shoes offer maximum ankle support and are used by the majority of power players, while mid-top shoes combine the best of both styles. Mid-tops hit at the ankle and provide the flexibility and support that fast players require because they are less restrictive than high-tops. Low-tops provide less support but are the lightest shoe. The sole of your shoe will make a difference in how you perform. Footwear technology is always evolving to develop better ways of cushioning and providing shock-absorption for players. For your midsole, look for a shoe that provides shock-absorbing material and stability. In the outsole, (also known as the bottom surface of the shoe) look for a shoe that is flat and wide to prevent ankle rollover and provide steadiness for fast foot movements. As with any sports footwear, take the time to test the fit of the shoe. Make sure the width of the shoe is snug, but not restricting. Pace and test out some running movements to determine your perfect fit. 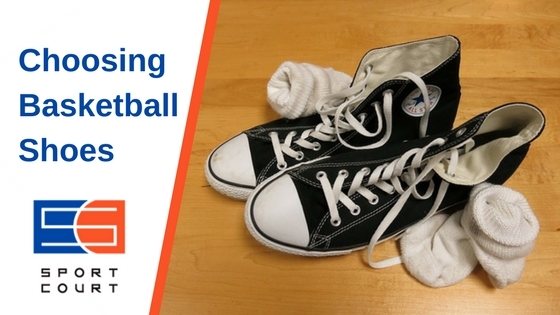 Remember that the perfect basketball shoe can improve your game and minimize the risk of injuries that range from blisters to shin splints to twisted ankles. To practice your basketball skills, take your new footwear out on your very own Sport Court. Visit our website for more information on practicing your game at home. ← Outdoor Hockey Rinks Have Major Benefits!